The unique relationship between humans and dogs around the world. There is unique and ancient bond between humans and dogs, from its early beginnings to the modern day. 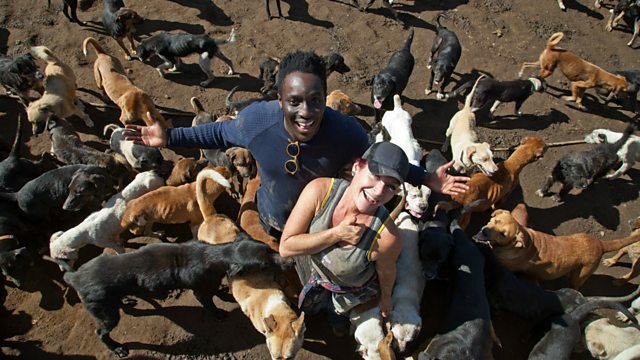 In Costa Rica’s extraordinary ‘Territorio de Zaguates’, translated as the ‘Land of the Mutts’, Ayo Akinwolere witnesses the day to day running of a refuge where dogs outnumber people by at least 100 to one. The slowly changing attitude to dogs in Costa Rica reflects the breadth of the canine-human relationship worldwide: from Ayo’s own pragmatic attitude as a child in Nigeria, the cruelty experienced by strays and pet dogs globally, to the extreme dedication needed to take in over 600 strays and keep them alive. Dog expert and behaviour guru John Bradshaw explains how the pooch and people relationship works and evolves. Recent Japanese research into the love chemical oxytocin (vital for bonding between mothers and babies after birth) is now recognised as an integral part of how we bond with our dogs. This bond is revealed in the inimitable stories of individual canine-human relationships. Ex-Marine Jeff de Young shares his story of serving as a dog handler in Afghanistan with his faithful black Labrador Cena. When Jeff lost seven friends in just three weeks, it was Cena who helped him through. Separated after the war, find out how Jeff and his faithful companion were re-united, and how humans and dogs can share an unbreakable bond. How did dogs become 'man's best friend'?